The Pittsburgh Penguins looked and were terrible in the fist period of game one, and then again in overtime. They ended up losing to the New York Rangers 3-2 in overtime and the world as we knew it was ending. Pens fans were calling for everyone's heads from Dan Bylsma to even Sidney Crosby. 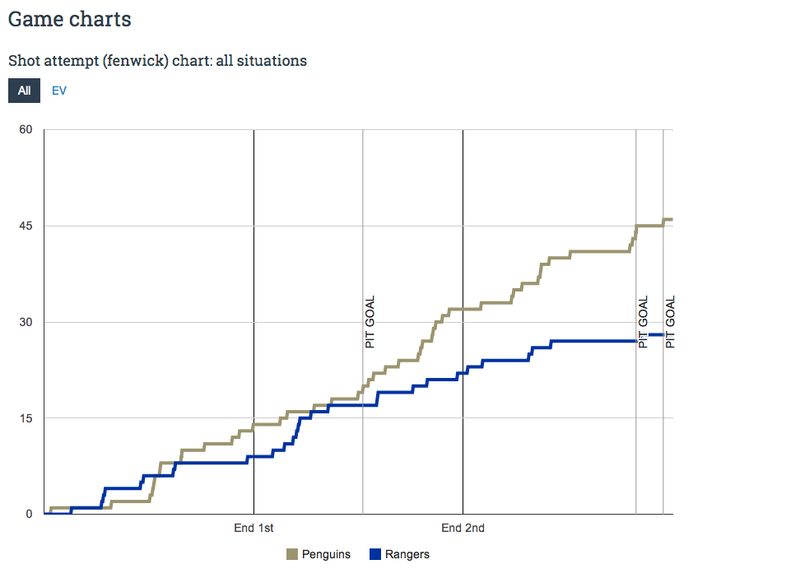 Perhaps, the biggest reason to be upset was the lack of effort the Pens played with for most of the first game. That has been an ongoing issue this postseason and even during the regular season. Can't question the Pens' effort in game two, as they played a really solid game for a full 60 minutes. That effort led to a 3-0 win, and the series being tied going back to New York on Monday night, less than 24 hours later. Again, I think the schedule will now start to catch up to the Rangers, who had to play a brutal seven-game series in round one, and are now playing their second set of back-to-back playoff games in less than a week. Not only that, but game three Monday night will be the Rangers fifth playoff game in six days. Factor in the fact that the Penguins are a very talented team that is dominating puck possession heading into game three, and I am really starting to like the Pens' chances. Going into the game, Sidney Crosby was facing perhaps the largest amount of criticism of his career. Crosby had not scored a goal in over 11 straight playoff games and had just two even strength postseason points this postseason. Well, Crosby did not end his scoring drought, failing to score on six shots on goal, but he was really good. Crosby dominated possession of the puck, created a ton of scoring chances, and certainly passed the eye test for most people. Fans won't be happy that he did not score, but if Crosby continues to play even close to the way he played Sunday night, something will eventually have to give. Evgeni Malkin is starting to play like the Malkin of 2008-2009. Malkin tallied two more points, one being an empty-net goal, and had five shots on goal. I wrote last week that Malkin needed to shoot the puck more, and in the last three games he has and it has paid off. Malkin had 16 shots on goal in the first five games of the playoffs, netting four points. Malkin has had 13 shots on goal in the last three games tallying five points. That is not a coincidence. Malkin is playing more aggressive and that is a good thing for the Pens, considering that an aggressive-Malkin won the Conn Smythe trophy in 2008-2009. Malkin was also involved in a post-game tussle with Rangers' goon Brian Boyle...I am not sure Boyle wants to go down that road. Both Marc-Andre Fleury and Henrik Lundqvist were really good. Lundqvist did everything he could to try and keep the Rangers in the game, but the Pens dominated the ice for the most part. Fleury did what he needed to do, stopping all 22 shots that he faced. Fleury is now 6-3 this postseason, and the win Sunday night was the 50th of his career. Martin Brodeur is the only active goaltender with more career playoff victories than Fleury. Fleury's shutout was also the seventh of his career and only three active goalies have more career postseason shutout than the Flower. So I have to ask, are we still benching him for Jeff Zatkoff? Despite what his critics have said and/or written about him, Fleury is actually having a really good postseason. 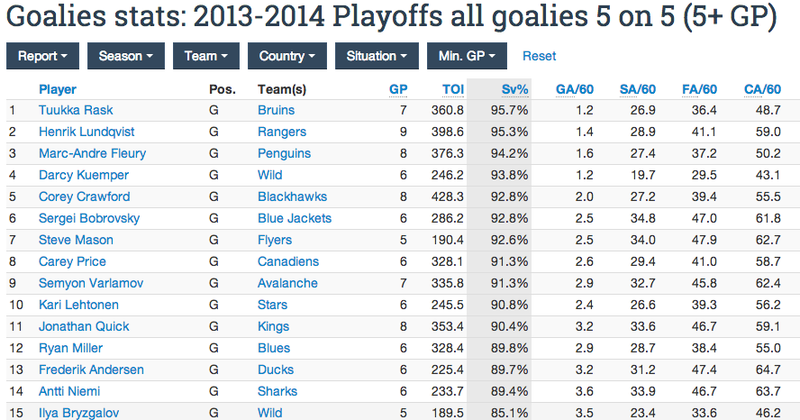 15 goalies have played at least five games this postseason and Fleury has the sixth best save percentage among them. Out of those same 15 goalies, Fleury has the third best save this postseason. Talk about exercising your demons. I love the combination of Kris Letang and Paul Martin. That has been by far the best ADJUSTMENT that head coach Dan Bylsma has made this postseason. Both Martin and Letang were fantastic and led all players in ice time. Letang scored his second goal of the postseason which ended up being the game-winner. Not only is this duo the best defensive pairing for the Pens, it allows the Pens to pair Robert Bortuzzo and Robert Scuderi together, and then cut their ice time. It's a win-win for everyone. By the way, I thought that Scuderi played his best game of the season in game two against the Rangers, especially on the penalty-kill. Jussi Jokinen is having a Hell of a postseason. Jokinen has four goals and seven points in eight games. Jokinen also has a point in six straight postseason games. Jokinen is also doing great in five-on-five situations. Out of Pens' players that have played in six or more games this postseason, only Crosby and Malkin have better possession numbers, and Jokinen leads the entire Penguins team in fenwick. When Jokinen is on the ice, the Penguins have a 72-43 shot advantage, which is just incredible. By the way, here is a reminder that last year 28 teams passed on Jokinen when Carolina put him on the waiver-wire. Thanks again Jim Rutherford. Marcel Goc continues to be a really underrated pickup for the Penguins and I feel like I say this after every game. Goc led all players in corsi and the I really like the line of Beau Bennett-Lee Stempniak-Goc. Going into this series, the Rangers' power-play was struggling, which was the biggest reason that I wanted the Pens to play them instead of the Flyers. Mostly because the Pens' penalty-kill wasn't too great against Columbus. 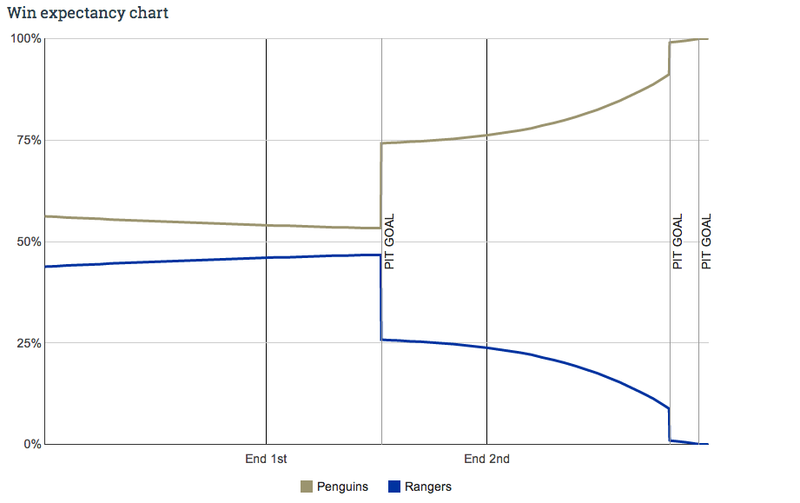 So far the Rangers' power-play has been exactly what the doctor ordered for the Penguins, as the Rangers have gone 0-8 on the power play in the first two games of this series. Looking forward to Monday, I think it's simple, if the Pens can play another game like they did Sunday night, they'll not only win game three, but the entire series.